Symphony Link™ – A revolutionary wireless system for wide-area IoT networks. Symphony Link is a wireless solution for enterprise and industrial customers who need to securely connect their IoT devices to the cloud. WiFi and ZigBee ranges are too limiting, cellular is too expensive and power-hungry, and most LPWAN systems don’t have the features necessary for your application. Symphony Link is specifically designed for low power, wide-area network (LPWAN) applications that are easily scalable and perform with best-of-class reliability. LoRaWAN and Symphony Link are two of the primary technologies under active development and deployment. LoRaWAN is an open protocol built using LoRa’s modulation scheme, which was developed for use by wireless carriers who want to use unlicensed spectrum to communicate with IOT devices in their network. It is designed for large-scale public networks with a single operator. Symphony Link is also built on LoRa’s chirped spread spectrum physical layer technology; it is an alternative specification to LoRaWAN developed by Link Labs. Link Labs serves customers who are trying to sell third-party connected devices in an enterprise or industrial setting. 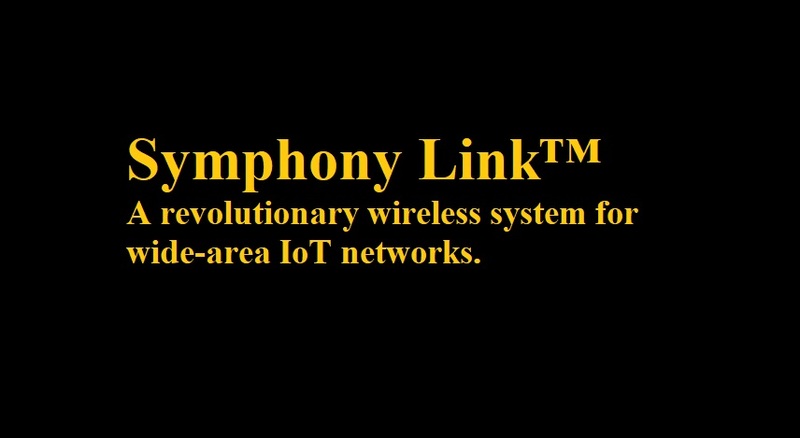 Symphony Link® is a wireless system developed by Link Labs. It is primarily used by industrial and enterprise customers who love the range of LoRa but need high reliability and advanced features in their LPWA system. LoRaWAN is a media access control (MAC) layer protocol designed for mobile networks, primarily in Europe. Both Symphony Link and LoRaWAN use Semtech’s LoRa modulation scheme. Essentially, LoRa is a waveform. It uses a chirped spread spectrum technology which encodes multiple bits per symbol, has integrated packetization and error correcting, and works with a great integrated baseband digital signal processor, called the SX1301. LoRa® is a trademark of Semtech. The role LoRa plays in both LoRaWAN® and Symphony Link® is at layer 1, or the physical layer. It is analogous to Frequency Shift Keying or another PHY technology in a different system. Packet error rates over 50% are common since LoRaWAN is an asynchronous, ALOHA-based protocol with very limited acknowledgements. Only one network can operate in an area without interference. It has no real multicast solution. LoRaWAN is designed around a 1% duty cycle limit driven by the European ETSI requirements, which prevents LoRaWAN from being used in systems that need the ability to send lots of data at a time. Duty cycle limits of the LoRaWAN architecture prevent repeaters from operating with that system. LoRa is incapable of real-time power and data rate control. LoRaWAN security flaws do not pose a significant risk for most users, but the use of pre-shared keys and identities does create vulnerabilities. Anyone operating a public LoRaWAN network needs to be granted a NetID by the LoRa Alliance. The LoRa Alliance is working hard to enhance the technology, but as of now, LoRaWAN is best for customers who want to develop solutions to connect to LoRaWAN public networks. For private networks we strongly recommend our customers use Symphony Link. Guaranteed message receipt. The Symphony Link MAC acknowledges every message, both up and down. No duty cycle limit. In Europe, Symphony Link uses the Frequency Hopping Listen-Before-Talk plus adaptive frequency agility band, which removes the duty cycle limit. In the 900 MHz Band, there is no duty cycle limit. Symphony Link is a synchronous protocol, repeaters allow users to expand the range of the network dramatically without impacting latency. They are also very power efficient, so repeaters can be solar or battery powered. The gateway is in control of the network it is creating, we implemented a quality of service tiering system to allow nodes with important traffic to have priority over devices with lower priority traffic. No per-device configuration. With Symphony Link, the host device configuration is the same for all devices of the same type, and key exchange is handled via our world class PKI based Diffie Hellman AES architecture. Real time power and data rate control. use of a Public Key Infrastructure (PKI), the over-the-air wireless channel is considered unbreakable by NSA standards. Multiple gateway coexistence and interference mitigation. By using asynchronous features like slotting, and uplink/downlink coordination, a Symphony Link network has over four times the capacity of LoRaWAN. No cost associated with a network ID. Operating a Symphony Link network does not require a network ID from the LoRa Alliance. Symphony Link does not interfere with LoRaWAN and vice versa. GPS asset tracking of golf carts at a golf course. Cellular solutions work well in these instances but have a high monthly recurring charge. In this use case, real-time adaptive data rate is important because, as a golf cart is driving around, the channel is changing dramatically. In order to work well, the tracking device needs the ability to update the power level and spreading factor modulation rate in real time as the channel fades in and out. Demand response in public housing. Hot water heaters can be retrofitted with DR controllers that are controlled from the Symphony Link system. Hot water heaters send usage information in real time to the gateway; when a demand response signal hits the gateway from the internet, it can turn off some or a subset of those hot water heaters in less than two seconds. Commercial building energy monitoring. A Link Labs module is connected to a pulse-counting sensor that goes in circuit panels throughout large buildings. With one access point in a building you can connect dozens to hundreds of subservice panels throughout the building to monitor electrical consumption.